Producing your own growing mix may seem less costly, but when you consider the equipment, labour, quality control and other factors involved, things may not seem as simple. Because most ingredients are sourced naturally, uniformity can be hard to obtain in a mix. The selling price of crops has not drastically risen over the past decades, but the cost of everything else has increased at a much faster pace. Growers have been very good at optimizing their production in order to maintain decent margins in spite of the increasing expenses for transportation, labour, equipment, chemicals and much more, including growing media. When you are looking at ways to cut down on your production costs, producing your own growing mix may seem like an attractive way to save some money, especially for large-scale growers. It certainly appears to have fewer implications than molding your own containers or manufacturing your own water-soluble fertilizers. Although some initial investment is required (building, hoppers, conveyors, mixer), the potential return on investment can be very appealing. However, many intangible elements of making your own mix can be overlooked leading to unforeseen additional costs that can have significant repercussions on your bottom-line. 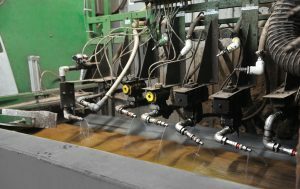 Before ordering and installing a mix line, it is important to carefully evaluate all the implications and validate that this is indeed a viable investment. Let’s explore some key costs that are often overlooked. Typically, a rudimentary mix line includes a balebreaker, large hoppers for the main components (peat, perlite, bark, etc), smaller hoppers for the fertilizers and lime, conveyors and a soil mixer to blend everything homogenously. In contrast, the mix line of a high-quality soil manufacturer includes much more equipment, such as a sieving system, mixing tanks for liquid feeds, multiple automated controllers, an integrated qualitycontrol system and more. All this additional machinery is meant to increase the homogeneity of the final product, which translates into more uniform plant development and more predictable results. In addition to quality equipment, you also need experienced and knowledgeable staff to make the proper adjustments and to make them at the right time. Adjustments must be made throughout the production process for uniformity, ensuring that the quality of the growing media is maintained throughout the process. For example, a fixed lime rate does not guarantee that the pH will be stable throughout the process of producing growing media due to natural variations of the components in the mix. A skillful workforce understands this reality and will take a proactive approach with frequent pH spot checks and lime rate adjustments during the production process. Real-time adjustments should be made at regular intervals throughout the production process to help minimize variation. Particle size has always been a critical aspect of growing media. It has a major impact on the air space and water retention profile of the mix, thus directly influencing the irrigation/fertigation strategy. 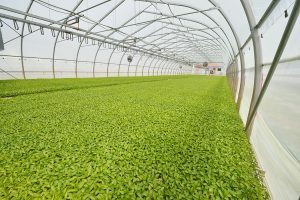 Growers can adapt by making adjustments to their practices in the greenhouse, but if the physical characteristics are too variable, they may need to apply different irrigation strategies to containers that retain too much water versus those that contain larger particle sizes and dry down more quickly. This is very labour intensive and can significantly throw off your production schedule. Using high quality components can help minimize these inherent variations. Ideally however, an adjustable sieving system should be included on the mix line to make real-time adjustments in particle size and reduce these deviations. Once again, qualified staff is required to analyze the particle size at frequent intervals and adjust the screening system accordingly. Final blending needs to be thorough but not excessive, as the materials need to be handled with care. Certain components are relatively fragile and can easily break down into dust if your mix-line layout is not designed properly or if your equipment is not calibrated adequately. An experienced staff can adjust the mixing equipment to minimize the breakdown of substrate components. A good substrate manufacturer will often hire and train staff to use an extensive system. But this takes time and money, and mistakes can be costly. Making accurate measurements while simultaneously blending multiple ingredients isn’t an easy task, yet consistency is the key to the performance of the product. If the product does not perform properly, additional chemicals or labour may be required to correct the issue. A small decrease in the fraction of sellable plants can rapidly eat up and surpass any money you saved by making your own mix. When a grower produces growing media for only a few weeks of the year, it can be more difficult to develop the same expertise and productivity. Mixing your own ingredients to produce growing media certainly seems like a simple enough operation; add some peat moss and perlite, sprinkle in a dash of lime and fertilizer, pour in some wetting agents and mix thoroughly. Baking seems so effortless on cooking shows but when we try it at home, we realize it is not that easy. Especially when we’re manufacturing large volumes of consistently high-quality substrate, it becomes much more complex. To manufacture a quality product, you need quality ingredients. Most ingredients used to manufacture substrates are sourced naturally, and their characteristics inherently vary from batch to batch, making it difficult to obtain consistency and uniformity. There are other advantages to making your own mix in-house, such as the flexibility to adjust your substrate to meet the needs of the crop in regards to pH, water and nutrient content or air space. However, producing multiple mix recipes typically generates a new set of challenges that will need to be addressed; the production line must be cleaned properly between products, equipment must be adjusted accordingly, final products need to be distinctly labelled, and so on. The needs of the grower have to be communicated clearly to the mix-line supervisor. I have seen growers having to re-transplant tens of thousands of plants and throw out hundreds of yards of substrate because of miscommunication. On the flip side, growing media manufacturers often offer a wide selection of products with distinctive properties and some even have the ability to manufacture customized blends for particular needs. Growing media is one of the pillars of the growing process. It anchors the crop and helps provide both oxygen and nutrients to the developing root system. The selected substrate may well determine how the operation will run down the line. The timing of the growing cycle, water/fertilizer management and the quality of the finished product are just some of the aspects that are directly impacted by the quality of the growing media. Mixing your own growing media can be an opportunity for savings when done correctly, but it is important to consider all of your overhead expenses or you could end up with unpleasant surprises. Everything must be considered: machinery, ingredients, additives, labour, storage, pre-conditioning of components, energy, maintenance, quality control – to name a few. It is typically more feasible for larger operations to find success with mixing their own substrate, while smaller ones may be better off using pre-made mixes that work for them, rather than going through the trouble of blending their own. A good growing media manufacturer should also offer technical support and analytical services to assist growers throughout their production – they are responsible for the media they provide. Who is accountable if the soil you manufacture yourself does not perform well? Pre-mixed growing media offers a peace of mind and eliminates at least one of the many sources of stress that a grower faces. This way, growers can concentrate on their many other responsibilities and work on reducing costs by optimizing other aspects of production that pose less of a risk to their bottom-line. Take the time to run some scenarios and make your calculations. If you are not sure about where to start, contact your local sales representative or consultant who has access to tools developed to help you calculate the actual cost of making their own mix, as well as suggestions for ready-to-use growing media or ingredients to make your own. With reliable numbers in front of you, you can better assess whether the potential benefits outweigh the possible risks to help you make the right decisions. Using pre-mixed media can offer peace of mind and free up time for other tasks. Each component in a growing mix offers characteristics that should be carefully evaluated and integrated to optimize growing results.